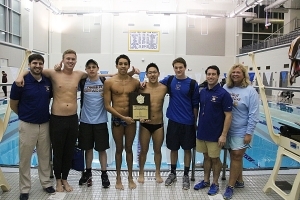 The Chamblee Bulldogs won the program’s fourth consecutive DCSD Swim and Dive Championship in 2016. DeKalb County swim teams come together for the 47th year to decide the county boys’ and girls’ swimming champions as Chamblee hosts the event today (Friday) and Saturday. The event opens tonight with the 1-Meter Diving finals beginning at 5:00 pm (boys) and 5:35 (girls). The swimming finals begin at 3:00 pm on Saturday at the Chamblee High pool. Chamblee goes for its fifth consecutive title after winning its fourth title in 2016 264-216 over Lakeside. The Bulldogs return senior Noah Oh, the 200 and 500 freestyle champion a year ago, along with sophomore Liam Bell who set a meet record time of 57.60 in the 100 breaststroke and also claimed the 200 individual medley. The Bulldogs also swept all three relays on the way to the title in 2016. Lakeside will be one of the top contenders in the boys’ competition and has 18 swim titles to its credit having won nine consecutive from 2004 to 2012 before Chamblee started its streak in 2013. The Viking return diving champion Sam Witcher and 100 butterfly champ Mark Rotolo as well as Charles Cadot (50 freestyle bronze) and Alec Bundesmann (500 free bronze). Dunwoody has 14 boys’ titles and last won in 2003 and also looks to knock off Chamblee after placing second in the 200 medley and 200 freestyle relays on the way to a third place finish a year ago. Senior Christopher Thames returns in the 100 backstroke where he set a new meet record of 51.15 and also grabbed silver in the 200 freestyle. Sophomore Juan Martinez won silver in the 50 freestyle and a bronze in the 100 freestyle in 2016. 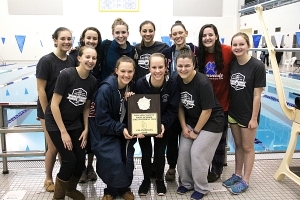 The Dunwoody Lady Wildcats came up just short a state title in 2016 and are the two-time defending DCSD Swim and Dive champs. In the girls’ championships, Dunwoody is the two-time defending champion and has 16 titles to its credit heading into this year’s meet. The Lady Wildcats return three fourths of the 200 and 400 freestyle relay state championship teams in Laura Spratling, Hannah Robison and Allie Reiter, which also won the 200 medley relay and 200 freestyle relay in the 2016 event. Reiter also doubled up on individual gold a year ago winning the county titles in the 200 individual medley and the 100 breaststroke. Megan Johnson returns to defend her 500 freestyle title. Runner-up Chamblee returns some strong swimmers as well this season as Julia von Biberstein (200 free champ, 100 breaststroke bronze) and Jade Foelske (100 butterfly champ, 200 IM silver) return to anchor the team. Lakeside won 14 consecutive DCSD titles from 1997 to 2010 before Dunwoody captured the 2011 championship to break the streak. The Lady Vikings have 24 titles overall. Julia Shuford leads Lakeside into the championships coming off a silver in the 100 breaststroke and a bronze in the 200 individual medley in 2016.